When I take my mountain bike out on the trails, besides getting a good workout, it relaxes me. For me it's a mindful experience being out in nature with only me, the bike, and the trail. However, because I live in Colorado, when the snow starts falling my bike finds residence in my garage until the sun starts shining again, I can shed my North Face coat, and the trails start drying out. During the winter, I usually find myself hanging out on the couch instead of getting the exercise I need. I absolutely hate going to the gym. So, that's why I was happy to hear about a fellow Colorado resident who developed an app designed to quiet the mind and make working out at the gym like being outdoors. 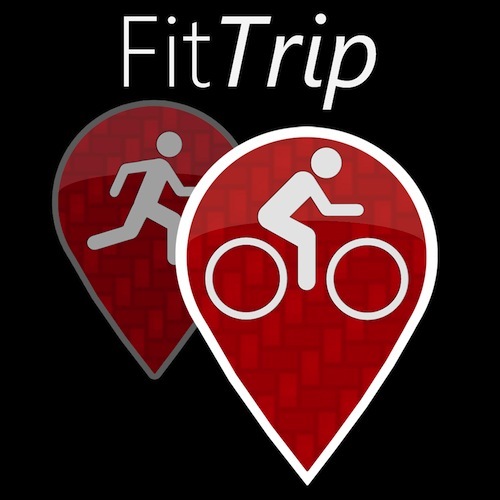 FitTrip is a new app created by Shane Schieffer, CEO of Gusto Technologies, Trey Marshall, and Nikhil Patel. It's currently on Kickstarter until Sept. 30, and has a Nov. 1 release date on Apple's App Store. I was fascinated with the app idea, so I emailed Schieffer and asked him several questions about FitTrip. Schieffer: I was training for a half-marathon with my wife. We were doing an 8-mile run on the treadmill because it had snowed. I was bored. I like the gym, but it can be difficult to maintain motivation and focus. So I found myself doing what I always do when I am struggling at the gym. I closed my eyes (tricky on a treadmill) to make the gym disappear and began picturing a favorite mountain biking course. Where was I? How hard did I have to be working on that section of trail? When was my next break/easy spot? And so forth. After a few minutes I realized that tablets (at that time still very new, this was April of 2011) were a perfect platform for creating an interactive experience. All cardio machines have book readers that tablets can be set on and the tablets have great processors and beautiful screens. The only thing that perplexed me was how to create the interaction. That night, as I tucked my son into bed, it occurred to me that heart rate and machine resistance are directly related, and so if I could adjust video based on heart rate it could account for effort and the difficulty of the terrain. Within the week my brother, my friend, and I started building a proof of concept. I quit my job that August. In October of 2012 I was able to bring together a team that includes two cofounders to pursue this full time. iPL: What is the overall purpose of using FitTrip? Schieffer: Interactive video is really just the “how” of FitTrip. The “why” is centered on a strange paradox. As adults we rarely get time just for ourselves. Everything demands our time: kids, jobs, spouses, etc. So any time we take for ourselves should be something we treasure. And yet we dread going to the gym. Why is that? Most people would say that it's because the body is working hard. I believe it is because the mind is in pain. The mind is disengaged from what the body is doing. Running on a treadmill and spinning on a bike takes no mental effort—you don’t have to pay attention. What does that leave the mind to do? It perseverates on work, on the stresses of the day, and on how slowly time is passing while the body is uncomfortable. The secret to making your time at the gym great is to make the brain turn off for a while. I believe that this is why studies show that outdoor exercise leads to greater stress reduction than indoor fitness. The purpose of FitTrip is to make the workout feel shorter and to help you feel more relaxed when the workout is completed. It is achieved by aligning your mind to your body so that it quiets down. iPL: What sports does FitTrip cover and how were they chosen? Schieffer: FitTrip was designed for flexibility and portability. It was important to us that users were able to engage in many sports, and we wanted to test a multitude of options so that users could tell us what they love. So far we have cycling, running, hiking, rowing, paddling, climbing, and even stand up paddling and swimming. Users don’t have to match a sport to a specific type of fitness equipment. They can mix and match at their discretion. While cycling and running will probably be the most popular, I find the paddling courses to be just as spectacular. The trips are selected based on geographical interest and raw beauty. So far we have selected trips by asking ourselves, “Where would we most like to go?” I also read blogs and surveys about people’s “bucket list” destinations. iPL: What are the best types of workout equipment to use with FitTrip? Schieffer: FitTrip works with any fitness machine; in fact you don’t even need a machine. There have been days I simply do pushups and lunges to a course. So whether you are at home, at the gym, or on the road you can use FitTrip. In fact, hotel gyms are a whole lot better when you have FitTrip. I think treadmills, ellipticals, and spinning bikes will be the most often used equipment. iPL: What kind of feedback are you getting from users who are now testing out the beta version of the app? Schieffer: Beta feedback ranges from enthusiastic comments like, “I would buy an iPad just to use this.” (after seeing a demo) and “I prefer running to FitTrip over running outside because I can be at the beach.” to suggestions about specific features. Triathletes would like to see us add power and cadence information from sensors. Racing friends is a feature that we are working on that is often requested. The coaching we are adding came from beta user feedback. And of course people have lots of ideas for courses. The more people interact with FitTrip the more they become excited at the depth of the interaction. We have put a lot into the app. iPL: What other type of gear is needed to use with the FitTrip app? Do you have to have this equipment to use the app? Schieffer: To use FitTrip at the fullest interactive capacity a user needs an iPad and a heart rate monitor. Without the heart rate monitor videos play at the speed I recorded them at. It is still beautiful to use. With the heart rate, users get not only interactive courses, but also some great stats about conditioning, calories, and heart rate zones. Coaching will further be based on heart rate. And when we get to gaming, it is our ability to know how a user really did the course (not only their effort, but their speed too) that will make the competition fun. The app speeds up and slow down the video footage to reflect the speed that you would be going if you were there in person. The reason we can do this is because the muscles need oxygen to exert force. The more force, the more oxygen. Heart rate is not a random event. The heart rate reflects the oxygen demands of the muscles. If a user speeds up or turns up the resistance on their machine then it shows up in the heart rate proportional to the effort. If they get off the bike and watch from the side then we will know. Their heart rate will betray the cheat. Unlike a video game it is your heart (not your thumbs) that control the interaction. We call it bio-interactive. To enable this interaction the user performs a five-minute calibration on a treadmill, we can predict how much force they are putting into their muscles based on their heart rate. 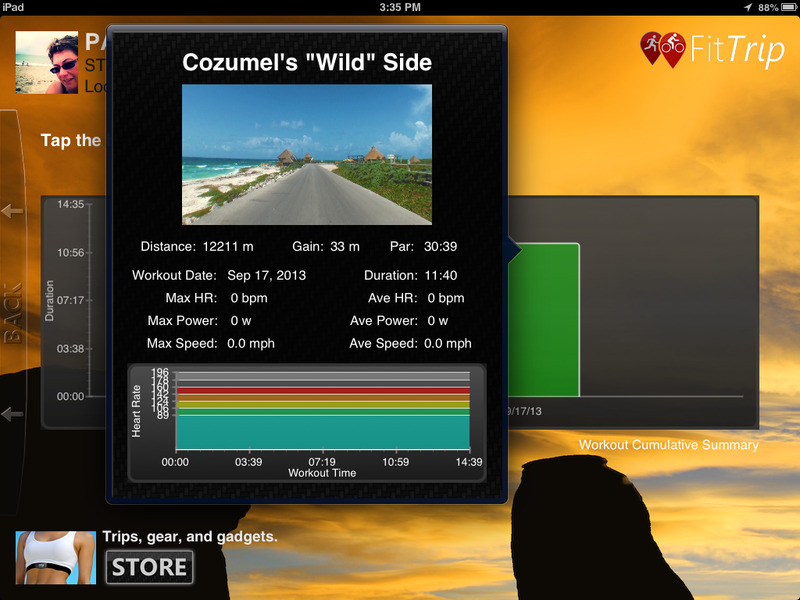 Every second the app compares that force with the sport they are doing, the difficulty of the terrain, and other factors such as weight, friction, wind resistance, and more—and then it predicts the speed the user would be going if they were actually in Cozumel, France, Patagonia, or wherever their trip has them. Why go through all this effort? Isn’t it enough for the trip to just speed up or slow down? No, not for us. We want the Alps in FitTrip’s video feel like the Alps in France. We want the coast of Cozumel to feel just as easy as it would be if you were on the sun-soaked road yourself. That is part of the magic of experiencing a place. It is why we go there. Schieffer let me preview the beta version of FitTrip. The video looked amazing on my iPad Mini. I was able to choose which trip I wanted and download it onto my iPad. I tried out Cozumel's "wild" side. I'll take riding alongside a beach over watching CNN any day! I look forward to the full version that includes videos of mountain bike trails. The cost of FitTrip is $5.99 a month or $59.99 a year. These memberships give access to all courses in the library, as well as courses that will be offered in the future. 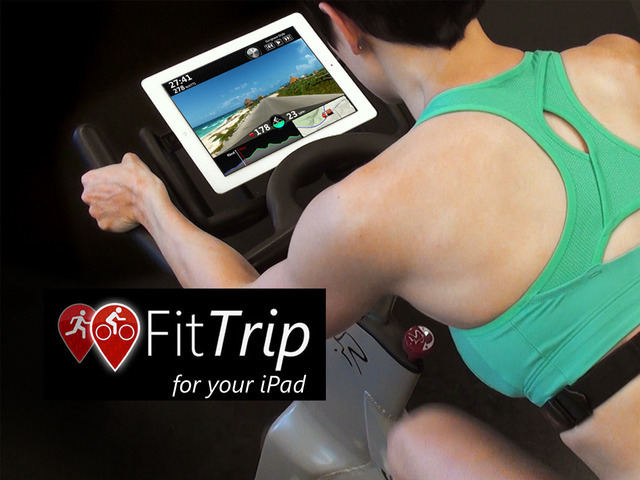 FitTrip works with iPad 2 and newer. An iPhone version is also in the works. I think I might actually force myself to go to the gym this winter. Exercise bike, here I come! Gusto Technologies is also helping the Boulder region with flood relief donations. Much of the area nearby was destroyed by record rainfall and flooding. Gusto Technologies is donating half of all FitTrip one-year membership costs to assist those affected by the devastation. Click here to help.